Deeply regarded as one of the most important cities of the American Revolution, Trenton is the capital city of the State of New Jersey. Situated on the banks of the Delaware River, Trenton was the site of the Battle of Trenton, considered by many to be the turning point in the American Revolution. Trenton was named after William Trent, who founded Trentstowne during the Colonial Era. In 1792, the town was renamed to Trenton and reincorporated as a city. Trenton continued to grow steadily as the industrial age came into full swing, becoming a thriving place to live and work. Unfortunately for Trenton, that did not last, and like many other northeastern cities, when manufacturing closed down the city fell into hard times. When Dr. Martin Luther King Jr. was assassinated, race riots consumed many of the cities’ businesses and caused millions of dollars in damage, which ultimately caused the majority of people who could move to flee for the suburbs. Today, Trenton struggles with crime, poverty, and attracting businesses to the city. However, despite that, many businesses still call Trenton their home, and despite setting a record number of homicides in the city in 2013, crime rates have begun to fall, and revitalization efforts are underway to transform Trenton into a place people want to live and work. For road fans, Trenton is often known as the site of the infamous Interstate 95 gap, a gap caused by cancellation of the Somerset Freeway. One incorrect assumption is that Interstate 95 was in Trenton – it never in fact entered Trenton’s city limits, but looped around it to the northwest into Pennsylvania by means of the Scudders Falls Bridge. Trenton has no Interstates that enter it’s city limits, but Interstate 295 and New Jersey Route 29 together form a partial-beltway around the city. Trenton is still served heavily by I-295 despite being outside the city limits. 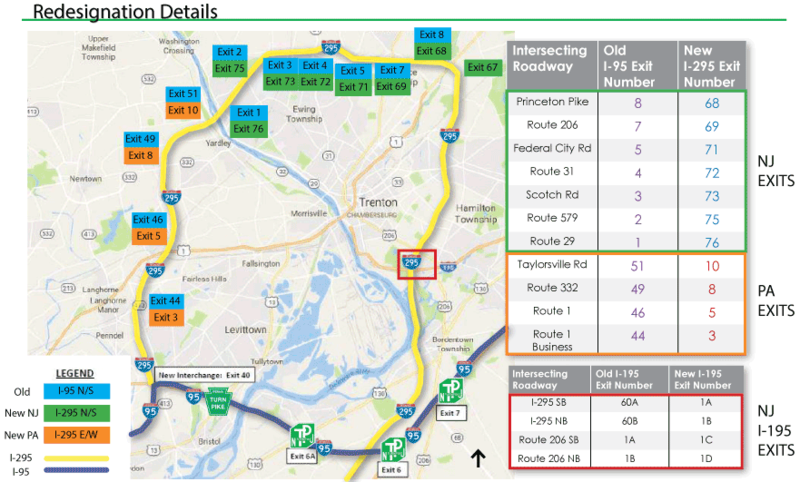 Within the city, New Jersey Route 29 shares partial freeway status in Downtown Trenton before transitioning into an expressway with traffic signals. U.S. Route 1, which enters from the northeast portion of Trenton, is a full-freeway road that provides access to Downtown Trenton as well as Morrisville, Pennsylvania by means of a toll bridge. While no Interstate actually enters Trenton’s city limits, all of them directly serve Trenton’s traffic in and out of the city. Interstate 95, which ended abruptly at Interstate 295 due to cancellation of a routing that would’ve taken it through the heart of Central New Jersey and linked up to Interstate 287 near New Brunswick, was renumbered ahead of completion of the Pennsylvania Turnpike and I-95 interchange near Bristol, Pennsylvania. The interchange is slated to be completed by fall 2018, but sign changes in New Jersey were underway to renumber I-95 as an extension of I-295 in January 2018. Interstate 95 previously followed the Trenton belt line northeast from Bucks County, Pennsylvania through Ewing township. Caused by the cancellation of the Somerset Freeway, the previous gap in Interstate 95 was located near Lawrenceville. The Somerset Freeway would have provided a direct connection to Interstate 287, to facilitate travel into New York. The freeway was renumbered as an extension of I-295, from north of the new Pennsylvania Turnpike interchange, all the way to the abrupt end at U.S. 1. Previously, the confusion by the gap was so great, that the New Jersey Department of Transportation posted trailblazers directing motorists to use Interstate 295 followed by I-195 to get back to I-95 via the New Jersey Turnpike. Interstate 195 runs from just outside Trenton all the way to Belmar, New Jersey. At the western end it continues as New Jersey Route 29; at the east end, it continues as New Jersey Route 138. It provides access to both the New Jersey Turnpike and the Garden State Parkway, linking the western part of the state to the New Jersey Shore. One plan involving the relocation of I-95 onto the Pennsylvania Turnpike and Pearl Harbor Memorial Turnpike Extension called for extending Interstate 195 north over Interstate 295 to Exit 67, and west all the way to the Scudders Fall Bridge into Bucks County. The designation would have ended at the Pennsylvania Turnpike Interchange being built to replace the old segment of Interstate 95 that ended abruptly. Instead I-295 was extended, but one change implemented for I-195 is the renumbering of Exits 60A/B at I-295 to Exits 1A/B. Interstate 295 runs along the eastern suburbs of the Trenton metro area before heading south towards Camden and Wilmington, Delaware. Originally, Interstate 295 ended at the current interchange for U.S. 206, which is where Interstate 95 was proposed to travel north through Central New Jersey, before ultimately being scrapped at the hands of angry residents and the Turnpike Authority, who feared it would steal away customers. Interstate 295 was then pulled back to the U.S. 1 interchange and Interstate 95 was extended to ultimately end there. The realignment of I-95 onto the Pennsylvania Turnpike and Pearl Harbor Memorial Turnpike Extension underway in 2018 coincides with a westward extension of I-295 from Lawrenceville to the Scudder Falls Bridge over the Delaware River. Sign changes started in January 2018 replace I-95 north/south signs with I-295 north/south signs. Through Bucks County, Pennsylvania, I-295 will be signed as an east/west route through to its end at the Pennsylvania Turnpike interchange with I-95 and Interstate 276 west. A previously plan would have truncated Interstate 295 from Exit 67 to Exit 60, with it renumbered as a westward extension of I-195. A separate proposal called for renumbering the former I-95 between Bristol, Pennsylvania and Lawrenceville as new Interstate 395. There are two U.S. Highways that actually enter the City of Trenton’s city limits, and one that serves the suburbs of the Trenton area. U.S. 206 runs from the northern edge of Trenton to the Trenton Battle Monument through the Downtown areas of Trenton before exiting at the southern edge into Hamilton Township. U.S. 1 is a full freeway through Trenton, and enters from the northeastern portion of the city before traveling south and exiting at a toll bridge for Morrisville, Pennsylvania. U.S. Route 130, while not entering the city itself, serves the Trenton suburbs of Robbinsville and Hamilton before heading south towards Camden. U.S. 1 is a full freeway route that connects Trenton to Morrisville, Pennsylvania by means of a toll bridge. The toll is only assessed when traveling south into Pennsylvania – there is no toll coming into Trenton. The freeway travels under Trenton’s streets before elevating above it as it heads north to the Lawrence Township border. This is the only full freeway route in Trenton. US 1 Business travels through the northern most parts of the city, before rejoining US 1 near the Brunswick Circle. A similar US 1 Business exists south of Trenton near Morrisville, Pennsylvania, but it stops being signed before the Calhoun Street bridge into Trenton. U.S. 206 runs from the northern edge of Trenton to the Trenton Battle Monument, a historic monument depicting George Washington pointing towards Downtown Trenton. From there, U.S. 206 splits and travels through Downtown Trenton as Warren Street and Broad Street. The highway meets up again at Livingston Street, where U.S. 206 becomes an undivided highway as it continues it’s trek through Trenton. After leaving Downtown, it passes through some residential areas and the Sun National Bank Center, before continuing south and exiting the city at the Hamilton Township border. There are a total of 4 state routes that run within Trenton. With the exception of New Jersey Route 29, all the routes are mostly undivided highways. New Jersey Route 29 transitions between freeway and expressway as it runs through Trenton. New Jersey Route 31 provides access to the northern areas of Trenton and it’s suburbs as well as providing a corridor linking Central New Jersey to Northern New Jersey. New Jersey Route 33 provides access from New Jersey Route 29 into the Downtown Trenton area via Market Street, before continuing eastward towards Freehold. New Jersey Route 129 connects New Jersey Route 29 and Interstate 195 to U.S. 1 and the area around the Sun National Bank Center. New Jersey Route 29, also known as the Delaware River Scenic Byway, runs alongside the western edge of Trenton, closely paralleling the Delaware River. It transitions from expressway to freeway past Lee Street, where it enters Downtown Trenton. The freeway then becomes an expressway with signals as it approaches New Warren Street, near Arm and Hammer Ballpark, home of the Trenton Thunder. The roadway continues as an expressway before re-transitioning into a freeway as it passes through the Trenton Tunnel and ending at Interstate 195 and Interstate 295 shortly after. New Jersey Route 31 serves the northwestern parts of Trenton before terminating at U.S. 206 at the Trenton Battle Monument. The highway comprises a 2 to 4-laned corridor linking Northwestern New Jersey to Central New Jersey. This corridor is often congested with traffic utilizing it as an alternate route towards Interstate 287 and the New York area. New Jersey Route 33 runs from New Jersey Route 29 all the way to Asbury Park, on the New Jersey Shore. Within Trenton, it serves the Downtown area as well as residential areas in the northeastern quadrant of Trenton. New Jersey Route 129 serves as a connector route between Interstate 195, Interstate 295, and New Jersey Route 29, traveling from U.S. 1 within the city through the area near the Sun National Bank Center before traveling through the residential areas in the southern area of the city and ending at an interchange with New Jersey Route 29. The road is a mostly 4-lane divided highway as it treks near the Sun National Bank Center. The road is also an important connector to the Trenton Transit Center, which provides rail access to Philadelphia and New York. Page Updated February 24, 2018.